Today is one of those days where nothing seems to be going right. The groomer butchered by dog’s previously fabulous curly locks. There is a mountain of laundry haunting me from the bedroom. My hair is doing this weird flip out thing that looks like I intentionally tried to mimic Jennifer Aniston’s iconic Friends haircut. I have green food dye on my hands that won’t go away. Pout. Pout. Pout. While thinking of what I was going to make for the blog today I told myself it better be bright and happy to chase these bitter blues away. It also needed to chase away the bulge care of the White Trash Cookies and Mayonnaise episodes of last week. I mean, I was headed to the beach this weekend! What on earth compelled me to bake such belly busters?! Ugh. Needless to say, my bikini was feeling a bit too teeny. 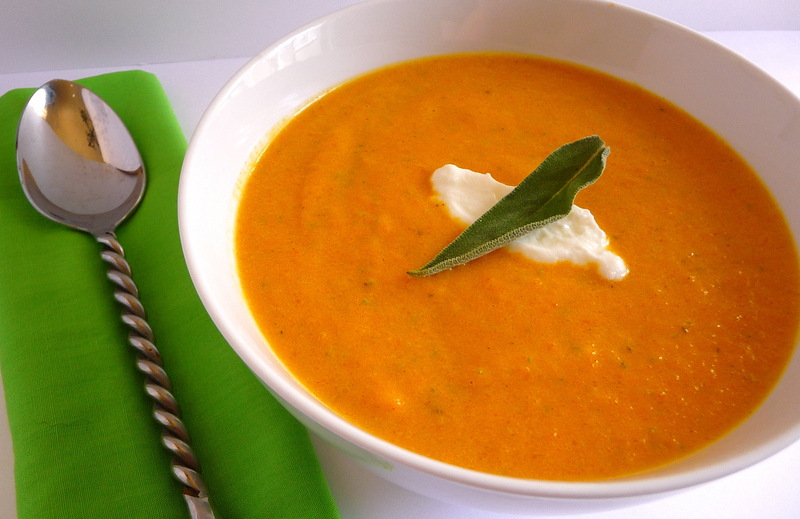 Anyway, after I write this, I’m going to go watch Real Housewives of Wherever and drown my sorrow in this yummy Carrot Soup with Sage and Yogurt. And I’ll pretend my dog isn’t giving me the evil eye over receiving the worst haircut ever. I might tear up a little if the Housewives go at it with pepper spray and then make up over Cosmotinis. Walnut and I will cuddle, and I’ll sip this soup, and I’ll try to pretend today is already over. Heat olive oil in a large pot over medium heat. Add diced onion and carrots and saute for 5-7 minutes until carrots are tender. Add broth and stir to combine. Reduce heat to medium-low and let simmer for 10-15 minutes, until carrots are softened. Add sage, thyme, cinnamon, salt and pepper at the last minute and remove from heat. In small batches, ladle about 2-3 cups of soup (depending on the size of your blender, never fill more than halfway when blending liquids) and blend until smooth. Save about 1 cup of mixture in blender to combine with yogurt and half and half. Blend until combined and stir into rest of puree. Pour entire blended mixture into a clean pot or soup bowls for serving. Garnish with more yogurt and fresh sage. Don’t cry into your soup, or on your dog named Walnut. He won’t appreciate it, I promise.